I think I may have already expressed this, but I think the crock pot is one of the greatest inventions in the world. It makes life so much easier; I love being able to throw a bunch of stuff in it, go to work, and come home to a hot, ready-to-eat meal. I have also made it clear that I reallllly love Mexican food. 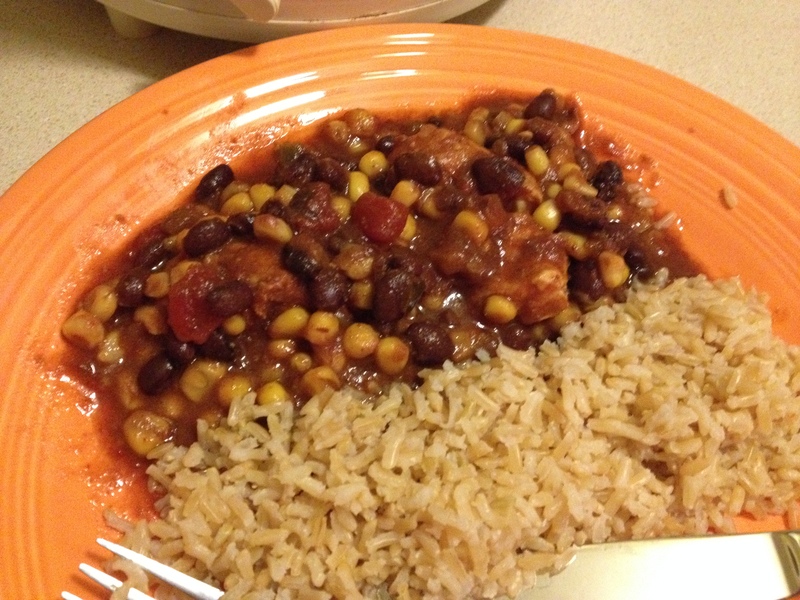 So when I mix the crock pot with a Mexican recipe…it’s a great day. Here is one of the easiest, but also most versatile, crock pot recipes that I have made multiple times and it’s always delicious. My sister made a similar chicken dish in Myrtle and it inspired me to break out this recipe again. Let me know how you like it! 1.) Throw all of the ingredients into a crock pot, mix together, and cook on low for 8-10 hours, or until chicken is done. The chicken pieces can then be kept whole or shredded, and served with brown rice, in whole wheat tortillas, or simply eaten as is (a nice low-carb option). Endless possibilities!